If predicting the future is dumb, then predicting advances in technology is even dumber. Challenges will appear that we’ve never contemplated, and knowledge we now hold dear will in many cases be proven false. The prediction game can soon become more a reflection of ‘us’ in the 21st century rather than ‘them’ in the 22nd century. And yet, as we enter a period of hyper-adoption of new technology, we have more data than ever before to give us an idea of what the world could look like in 100 years. And we know one thing, it’s that the future is going to be home to some amazing technologies. By the year 2100 the average temperature is projected to increase by at least 1C. Cue rising sea levels, which will threaten hundreds of cities worldwide. One solution could be floating cities, which the Seasteading Institute has been trying to encourage for years. It’s already happening in French Polynesia, where Blue Frontiers is planning the Floating Island Project. “I foresee huge floating cities that can move, join together, pull apart – that’s the sort of future I see in a hundred years, not only because we will need to because environmental issues will become more severe, but because technology will make the ocean a lot more hospitable,” says Paul Amstrong, founder of future technology consultancy Here/Forth. He name-checks 4D printing and graphene as two of the technologies that will enable us to construct those cities, and adds that plastic-digesting nano-bots could be used to clean up the oceans, even gobbling up the Great Pacific Garbage Patch. Life expectancy for the United Nations-projected 11.2 billion people living by 2100 may not increase drastically, but older people will be healthier. Brain-computer connections are already possible, although developing the software and interfaces is going to take time. Another massive trend will be personalised medicine; expect medi-pods in our homes that can diagnose problems, and implants that do the same on the move. Beyond both driverless cars and Amazon wanting to use drones to deliver parcels, the far-flung future could have a completely new kind of airspace. At present, global airspace is managed in a rigid ‘airspace corridor’ way, purely for the benefit of commercial and military aircraft, but that could change. “Global airspace could be managed in a continuously flexible and dynamic way for the benefit of all,” says Robert Garbett, founder and CEO of Drone Major Group. Garbett forsees “an airspace populated with vertical columns used by aircraft making sub-space jumps, shifting geo-routes allowing passenger drones to pass safely at any altitude, and shifting geo-fences protecting manned routes and high-value assets”. That kind of dynamic use of airspace could lead to an explosion in unmanned transport systems – drones. 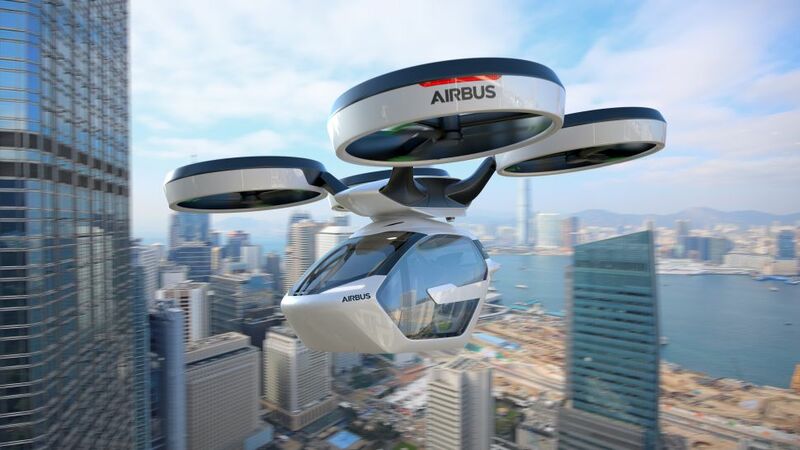 It could mean “driverless flying taxis in our smart cities, and reduced accident response times through the use of driverless ambulances”, according to Garbett, while also making traveling to work a breeze by opening up rooftop drop-offs in built-up areas. “The sky above us is an untapped sea of air that will have incredible value as the drone industry expands,” Garbett adds. We live on a ‘blue planet’, but we’re short of ‘blue gold’. Droughts are on the increase, and where there’s drought, there are dams, and inevitable political conflict. However, the potential water wars of the future could be avoided if humans were able to so something that sounds like it should be simple: drink the sea. Desalination plants remove salt and minerals from water to make it drinkable, but getting seawater into a plant is incredibly energy-intensive. Cue a fossil fuel-free idea from New Mexico-based wave energy company Atmocean, which involves wave-harnessing pumps to get seawater ashore more cost-effectively. Trialled off Peru a few years ago, the system also produces excess electricity. From drinking water to irrigation, aquaculture and greening the deserts, advances like this in desalination technology could make a massive difference. The creation of micro-filtration using graphene sieves should also allow so-called ‘toilet to tap’ technology to extract water from urine in homes. Gulp. “We know that how we produce food now is unsustainable, so in a hundred years we’ll start to see a radically different way of feeding and farming,” says Armstrong. “Soon we’ll be able to have a meal that is nutritionally sufficient – it’s just about figuring out what the body needs, and listening to it,” he says, adding that nano-materials and nano-technology that can live inside the body will become important. It’s already happening; in the US, the Food and Drug Administration just approved a digital pill embedded with a sensor that send data to doctors detailing whether patients have taken their medication. The same could happen with food in humans and animals to introduce precision consumption. Artificial intelligence is so over-hyped right now that it’s obviously a reflection of people’s pathetic fears about ‘robot takeovers’. But AI and computing power are destined to become the enablers for something 22nd society will need a lot of: energy. Per capita energy consumption is already rising so fast that we’ll need a miracle to prevent humanity from entering a period of energy-starved stasis. Is that miracle nuclear fusion? “Fusion will certainly be an essential part of the energy mix by 2100, providing between 15% and 35% of global energy,” says Jonathan Carling, CEO of Tokamak Energy, which is now testing its third fusion reactor. AI is currently being used to develop the all-important models of plasma physics, so that scientists can predict how reactions will work. Once we’ve cracked it, humanity will have low-carbon energy forever. Can technology solve all of humanity’s problems? It can, absolutely – but whether it will or not depends hugely on whether humans allow it to live up to its potential. What happens in the future also largely depends on discovering that what we know now is probably wrong. “Futurology is a risky game,” says Dmitry Bagrov, MD of DataArt UK, who thinks that what would be really be fascinating is to be able to travel to the future, so that we could travel back to see the present. “A backwards time machine would depict our world now, as it actually is rather than the imagined present we live in,” Bagrov adds, explaining that we have yet to understand our context, and what is real and what is not. “Think of all the deeply held, but wrong, theories, that have existed over the years – the flat Earth, the four humours theory, the alchemists – and imagine if we had a machine to show us all of this now.” Much of what we think we know today will, by the year 2100, be considered archaic pseudoscience. “Hopefully, the future will give us technology to truly understand the past so that we don’t repeat mistakes in the future … of the future,” says Bagrov. Time machines may be beyond even 22nd century engineers, but don’t underestimate the importance of a raft of upcoming technology – some seemingly simple, some incredibly complex – will change the world.